I was recently in Perth for a friend’s wedding and took the opportunity to take an extended long weekend and head down South to the Margaret River region to take in some of the amazing beaches and sample the local food and wine. To do the region justice you really need to have your own car. 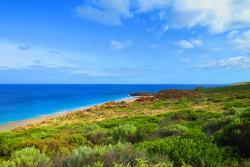 The Margaret river region is approximately a 3 hour drive from Perth city. The drive down the Forest highway bypasses all of the coastal towns however if you need to break up the drive you can take any of the turnoffs. There are a number of roadhouses along the way to stop as needed. I can recommend a stop at the Bunbury Farmers market to stock up on produce for your trip but will talk about that shortly. When researching where to stay on this trip our criteria was beach front and relaxing. We nailed this brief when choosing to stay at the amazing Injidup Spa in one of their 10 luxury ocean villas. Located in Yallingup, as you approach the secluded property you are immediately off the grid, literally there is no phone reception here, bliss. The site is nestled in to the hill and offers stunning views from your villa including private deck and plunge pool. The villas contain all the mod cons with an amazing view and they are self-contained with small kitchenette and BBQ so you don’t have to leave. One and two bedroom villas are available here. 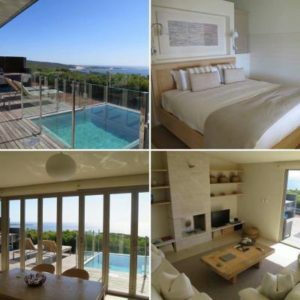 If resorts are more your style, then have a look at the Pullman Bunker bay resort and Spa which is a very secluded resort tucked in to Bunker Bay. Including on site dining options you could easily slip in to the South West life here however recommend you leave the resort also and check out the beach at Bunker Bay. They have a range of accommodation options from 1 bedroom studios through to 1 & 2 bedroom villas. Smith’s beach is a hidden gem in a quiet nook of the beach. The patrolled beach is great for family’s and there are a couple of beach front accommodation options including 1 & 2 bedroom beach shacks, 1 bedroom apartments and 3 – 4 bedroom beach houses. Smith’s beach resort are self-contained directly in front of the beach. With ocean views and walk across the road to the beach, why would you want to leave! Right next door to the Smiths Beach resort and is the Canal Rock Apartments. With sweeping views across Smiths Beach and Yallingup in some instances the 1, 2 & 3 bedroom villas are another great option. Whilst it was hard to leave our gorgeous villa at Injidup we had come to the region to enjoy the local food and wine so we set off to find some great dining spots. There are many wineries in the region that have onsite restaurants, suggest you plan ahead though as we found, the of majority winery restaurants run a lunch service only. There is a reason why this winery is a popular choice for Bride and Grooms to get married when you arrive and take in the stunning outlook. Set on top of a hill and with sweeping views across the vineyard and out to Eagle Bay we enjoyed a lunch with an incredible view. Recommend you book ahead to make sure you don’t miss out on a table with a view, they can be quite busy during peak times. Open for Breakfast and Lunch 7 days & Dinner on Fri & Sat nights. 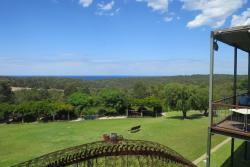 When I think of Margaret River wines Vasse Felix is easily the most recognisable vineyard that springs to mind. One of the first makers to arrive in the region they have won countless awards for their wine and accolades internationally. The restaurant is in a beautiful building and again book ahead to secure a table with a view on the balcony to take in the view over the vineyard. Food and wine here was amazing. Open daily for lunch. If you are staying at Injidup spa and don’t want to leave (like us) then there are a number of self catering options in the area. If driving down from Perth suggest that you pull in at the Bunbury Farmers Market (right on the forest highway as you come in to Bunbury) which I can best describe as a giant supermarket full of local produce. They sell fridge bags so pick one up and stock up on everything you will need for your stay in the South West. Lamont’s Deli and Winery at Smiths beach sell a range of pre prepared hampers to choose from. You can order ahead and they can organise delivery to your accommodation if staying local. We had the tapas hamper on our first night and sat out on the private deck of our villa to enjoy the sunset. If you would prefer to leave the car parked and have someone else do the driving for you whilst you visit the winery’s in the region, then there are a number of local tour operators that run winery tours in the region. For a bit of indulgence or a break from the wine, visit the Margaret River Chocolate factory. You can see here the chocolatiers in action producing the different flavours. Of course, there is plenty of chocolate available to purchase and an onsite café. Next door is the Margaret River Providore which is laden with local produce that you can try before you buy. They sell a very extensive range of olive oil and other beautifully made jams, preserves and sauces. They also have a cellar door where you can sample some more wine and their chocolate liqueurs. We are beach people and were set on exploring the region in search of the perfect beach. Speaking to locals in Perth prior to our visit the common theme was go to Meelup Beach, we weren’t disappointed. 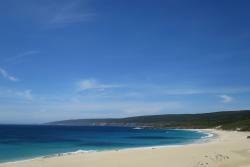 Crystal blue waters, small lapping waves and white-sand greeted us at this family friendly patrolled beach. Part of the Meelup National Park this beach is protected from the elements by being tucked into a bay and makes for a great stop. The whole cape has the most beautiful coastline for both surfers and swimmers alike and Smiths beach is no exception, with beautiful blue water and white sand. A lot more surfing activity here however definitely still good for swimming. This is also a lifeguard patrolled beach so perfect for families. Just around the bend from Smiths Beach is Canal Rocks which is an unusual rock formation marking the border between Smiths Beach and Yallingup Beach. In calm weather this is the perfect spot to go exploring the rock formations and if you are more adventurous jumping into the water below. This is a great spot for watching the sunset too. And don’t forget the beautiful and rugged Yallingup Beach and its untouched beauty, not ideal for swimming but make sure you check it out all the same. Thanks for reading our tips for the Margaret River, I hope I have inspired you to travel Australia and check out some amazing coastline. 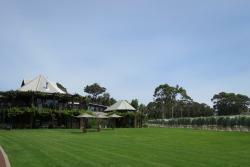 For more information or to plan your trip to Margaret River, contact a member of our team on +61 3 9509 1985.